Strike Vector is a new, third-person aerial combat game under development by a team of four, using the Unreal Engine 3. The first trailer was released today, showing off the multiplayer battles that the devs (who currently share the name of their group with the game itself) are touting as the core focus of the product. It looks kind of like someone dumped a bucket of Gears of War all over StarFox 64. The official FAQ gives the ever-popular release date of "When it's done," and clarifies some minor details about the gameplay. 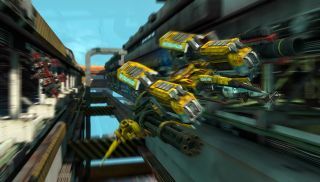 As shown in the trailer, your vehicle will have two modes: a speed-focused Jet mode, and a Hover mode which "offers an experience closer to a classic FPS gameplay with increased precision, ironsight and strafe based evasion moves." The game looks pretty far along for having just been announced. We'll keep an eye out for any beta announcements or other opportunities to try it out.